As previously reported on 17 October and November blogposts, new Machin definitive stamps will be available from 3 January 2013. 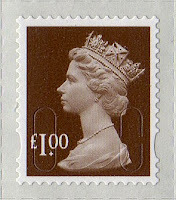 The two 1st class stamps will change from Diamond Blue to Royal Mail Red, and the 50p and £1 will also change. The 1p-20p stamps will also be issued with an iridescent security overprint for the first time. We did not expect the low value stamps to be available in all Post Office branches as they are not - from Royal Mail's philatelic point of view - fundamentally new stamps. But we have recently been told that the other 4 values will not be sent to all Post Offices for the day of issue, and that the initial distribution will be confined to the 24 Philatelic Offices* and some others. This may mean that not even all 370+ Crown Offices will have them. Other Postmasters can order these stamps if there is a demand, so if you have a regular PO where you buy your new stamps, ask the postmaster if he will order them! He may have to contact the helpline to find out how. 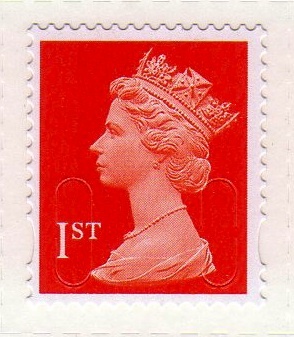 Royal Mail's research has shown increasingly that collectors are not buying new definitives and definitive FDCs at Post Office branches on the day of issue, and there will be no general distribution of blank First Day Envelopes. Bristol, Cambridge, Chester, Colchester, Croydon, Durham, Edinburgh, Exeter, Glasgow, Grimsby, Harrogate, London (Eastcheap and Trafalgar Square), Norwich, Nottingham, Plymouth, Portsmouth, Southend on Sea, Stevenage, Stroud, Trowbridge, Truro, York, and Newport Isle of Wight. 1st class Large counter sheet, booklet of 4. Awaited: Business Sheet. - £6.25 without the coil or business sheet stamps. If you wish us to obtain FDCs for you please contact us as soon as possible at ian@norphil.co.uk so that we can obtain stocks. Orders must be received by 21 December. NB: Just over a week later the 1st class stamp from the mixed London Underground book will be issued, and we will do FDCs for that single stamp for £4 each, to be despatched with the above. Please let us know if you also want that FDC. Is there a list of the 24 Philatelic Offices? Good point Doug. There are listed on the inside cover of each month's Philatelic Bulletin, but I'll add them to the blogpost. You make a good point, John. I'd forgotten the public holiday. It is possible that they will be despatched from TH on Friday 28th or Monday 31st. I've had mine for several weeks John - those are actual scans on this and the other posts. If Grimsby is a philatelic outlet then Royal mail don't make life diffecult for collectors! I gave up doing a 70 mile round trip to obtain new stamps several years ago. It is very good for lotery tickets though. Sorry but the best Philatelic Outlet has got to be York. They do an excellent service in Lottery tickets, Passport Applications, Photographs from the Photo machine next to the counter, Driving Licence applications, balls of string, sellotape and any thing else not remotely connected to philately, the only thing they appear to have run out of / never bothered ordering in the first place is anything with a stamp on it / in it or near it. Do these counters get paid extra for providing a "Philatelic Outlet" ? because it is about time they started earning their money or RM / PO Counters should start and ask the Head Postmaster a few searching questions and then get rid of this non functioning place. if they despatch them earlier as you suggest, there is a risk there are deliver on the 2nd in England! Some even got the coil stamp, which is more than we have so far! My ones arrived today(2/1/13)from Tallens House. I phoned every post office in the Hereford area and not 1 had any of these stamps in on the day of issue, bang gos the possability of a fist day cover.